Source: Debra J. Groom blogging on Syracuse.com. "School district officials wanted to alert district residents that there were no problems today at Oswego High School or Leighton Elementary School. Five state police vehicles were parked along Buccaneer Boulevard Friday, Nov. 3, but were there as the New York State Police Troop D canine units conducted training at the high school while providing a community service to the district." Yesterday we stood in freezing rain outside of Bath Iron Works for an hour during the shift change. Aside from the ankle deep slush it was warming to be standing with the Smilin' Tree Disarmament Farm organizers of the annual Advent series of vigils outside the gates where weapons of mass destruction are made by hard-working Mainers. Some of the workers were quite angry to see us while others exchanged friendly greetings with Bath resident Bruce Gagnon, a regular outside the gates when the shifts change. Hundreds walked or drove by Bruce's sign: "Zumwalt Provocative Expensive" referring to General Dynamics' (the corporation that owns BIW) latest product. One worker assured Bruce that "Ships protect the peace, ships keep us safe." Bruce politely disagreed, noting that the Zumwalt is a first strike weapon. 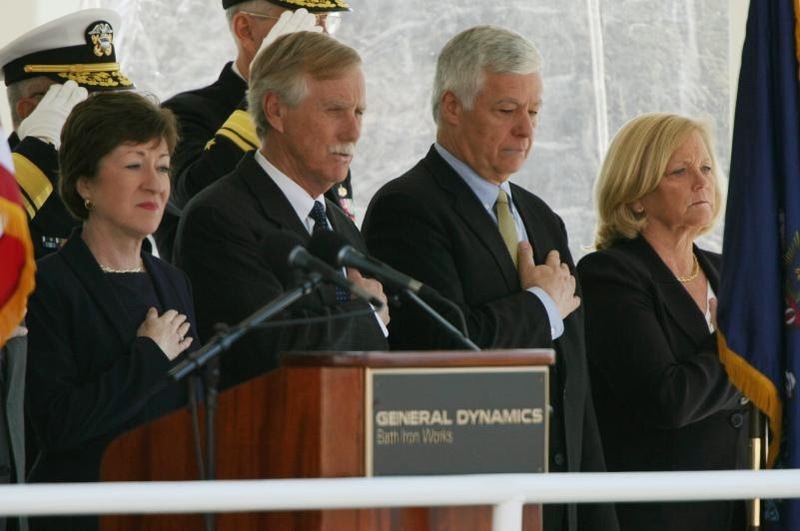 Maine's entire Congressional delegation paying homage at the launch of a $4 billion Zumwalt destroyer last April at BIW. While standing I had time to connect with peaceworker Jane, who is 83 years old and can hold a sign for an hour in freezing rain without wearing gloves. Jane recently moved to Maine from Vermont, where she worked extensively in counter recruitment in the schools. Military recruiters in public schools use local, state and federal tax support to provide access to teenagers and sometimes even children younger than that. It's one of the ways education dollars are redirected to support the aims of our highly militarized and violent culture. Another way came to light when we circled up at the end of the vigil. A vigiler who works at Rockland High School told us that she came out of her office this week to find the school was in lockdown mode. These are drills which are supposed to keep students and staff safe in the event of a school shooting. However, this drill went far beyond locking doors and closing window shades. Every student was ordered to line up his or her backpack in the halls and then hide in a classroom while police moved through the packs with several police dogs trained to sniff out drugs. None were found, nor did the school have information that any would be found. Just a drill, folks. The dogs also sniffed the cars in the parking lot, including those of the adults who work there. A warrantless search that, again, found nothing. It seems clearly designed to scare people, and the woman who told us about it indeed reported that she found police dogs sweeping through the halls very intimidating. Rockland police, assisted by canines and their handlers from the Knox County Sheriff’s Office and Lincoln County Sheriff’s Office, took about 45 minutes to search for drugs, said Rockland police Detective Sgt. Chris Young. He said students were instructed to take their backpacks and leave them in the middle of the hallway outside their classrooms and then return to class. The school-wide search was done at the request of principal Renee Thompson. Thompson said that there had not been problems with drugs at the school, but she wanted to be proactive and send the message to students and the community that there is a zero tolerance for drugs on campus. Also zero tolerance for the Constitution, apparently. Hope the U.S. government students don't get those questions wrong on the AP exams they weren't studying for while helping police and sheriffs practice teaming up to intimidate an entire student body. If, like me, you're keeping tabs on the creep of fascism in the USA, you could note that your rights are checked at the door when you enter a school run by the likes of Principal Thompson. Or Oswego High School in New York, or who knows how many others with militarized police and county sheriff's departments bringing in dogs for your "safety." If you're in Maine you can join the Smilin' Trees Disarmament Farm's annual Advent peace vigils at Bath Iron Works (BIW) on December 13 and 20. Folks meet from 11:30am on Washington Street in front of the BIW administrations building.